A month ago we had a story from guest contributor Derek Miller regarding the media's coverage of supposedly fluffed Old Firm attendance figures, highlighting The Daily Record's front page exclusive by John Ferguson, "RIDDLE OF PHANTOM FANS," and a similar piece by Tom English in the Scotland on Sunday, parroting the data from the Record, titled "Old Firm guilty of massaging numbers." I'll be honest here: Anyone who's seen shots of Parkhead this year and compared those to their reported attendance figures knows what's what. Quite frankly, I don't care and you probably don't either. However, the Record went out of their way to show that the attendance for the 20 October match against Queen's Park had been heavily doctored, even going so far as to include a snap in the original web run of the story with a swath of blue seats visible. Of course that picture was from the Dundee United Scottish Cup tie on 5 February 2012, and not from the game in question. The Record was quick to correct. What Ferguson didn't bother to do apparently was look at a single photo of Ibrox on the day. Anyone with their eyesight intact could see that the place was packed. So when the Record went with 34,481 as the attendance on the day one had to laugh a little, after cringing at the fact they were reading such a publication. English, mercifully, went for the average attendance figures over the campaign instead of focusing on just one fixture. That doesn't mean his story was not woefully wrong, just that he didn't highlight a single point for me to bash him about the head with. Now, the Record cited a gap of 14,982 between this "official" figure (which was obviously ludicrous) and the reported figure, 49,463. They offered a correction of sorts to their story a few days later by saying the police had amended the figure to 40,622, still a little light but we're getting closer. 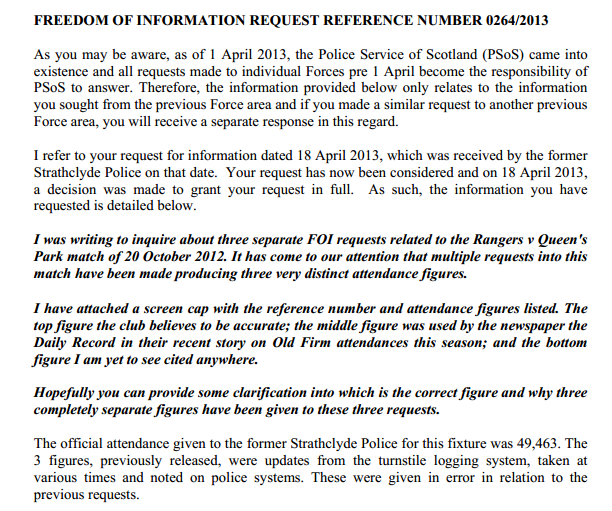 Problem is, there's no FOI request on record with that figure listed anywhere. (There is one with 34,481 but we'll get to that.) And if I left it up to you to guess what Police Scotland is saying the actual attendance on the day was, what would your best guess be? That's right, the 49,463 given by the Club and reported by the SFL. The number out of all of these requests that anyone who saw Ibrox on the day would've gone, "Yip, that sounds about right." Now, to be fair to Mr Ferguson, there were three prior FOI requests that included this particular match, all three giving wildly varying responses. The Record's original request was returned for clarification prior to being fulfilled. What that clarification was, we don't know. Again, that doesn't account for the fourth figure (40,622) thrown out by the Record when people called their bluff, but fair enough, I suppose. So the Record via Ferguson and the Scotsman via English both published incorrect figures related to Rangers' attendances this season, and drummed up a whole furor of "Rangers are cooking the books!" for a couple weeks. And all of this could have been avoided had either of them set aside their inductive glasses (Rangers must be padding their figures) and put on their deductive glasses (the ones a newsman should have at all times) and simply looked at the images of Ibrox from this season. Good effort, boys. But horribly wrong yet again.